We work with the high school team to put together a strong instructional curriculum that will serve as the basis for each practice. 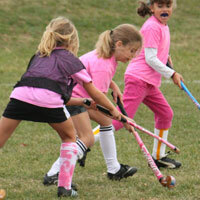 The curriculum will be based on a program the United States Field Hockey Association recommends for younger players. The high school players are very excited about the opportunity to instruct your child and are developing additional fun activities to make this a memorable experience for all involved. Donate your used field hockey equipment! Have any field hockey sticks or field hockey balls laying around that you do not want or need anymore? We will gladly take any sticks or balls that are decent enough for our girls to reuse. Please contact the , Jennie Schmoyer. Each registered paid player will receive a t-shirt that will serve as their game jersey. Each team member will have the same color shirt. Be sure to fill out your daughter’s t-shirt size when you register her on the website. This way the shirts will be ready for the first night of practice. We will be practicing and playing on the Middle School field hockey field. The entire program will offer three levels of training for the upcoming season. NOTE: This division will focus more on drills, stick skills, and physical fitness, rather than organized games or scrimmages. There must be at least one parent coach per 10 players in this division or we will not be able to offer it. 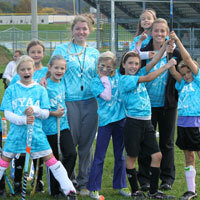 Coaching instructions will be given to volunteers if they do not have field hockey experience. NYAA coaches must have security clearance (details will be given to coaches and is a free service to you paid for by NYAA). Please contact the , Jennie Schmoyer, if you are willing to help in this role. Again, if no parents volunteer to help with this division, we will not be able to offer it. Focus is on basic stick skills as well as other fundamentals to the game. Practice drills and game like situations will begin as more of the rules of the game are introduced. Beginning in this 2014 season, Senior Division will be playing on a full field. Eye protection is HIGHLY recommended and required in Middle School so it is worth the safety investment. The Senior Division will learn in more detail positions on a full field (goalie, offense, and defense) and basic rules of the game. In order to do this fairly we will break the girls onto different teams each week so they can learn many different positions on the field. Note: Girls entering 7th grade for the 2015-2016 school year can try out for the Northwestern Lehigh Middle School Field Hockey Team. The following information is designed to make sure that your child is ready for the upcoming field hockey season. 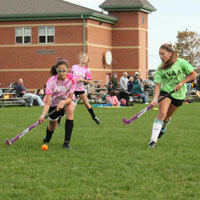 NYAA field hockey will provide most of the items your child will need for the upcoming season. The remaining items you will either need to purchase or borrow from someone. Field hockey stick: NYAA will be providing sticks to borrow for the season for all girls in the program. We will hand out the sticks at the first practice, and it must be returned after the last game. For the majority of you, it is your child’s first time playing field hockey so it's recommended that you have her use the NYAA stick for the season and purchase one later if she enjoyed the sport. If you have your own stick, be sure to bring it to the first practice. Mouth guard: We will have some for purchase if you forget or lose your own mouth guard for $2) and they are also available to purchase at sports stores or look in retail stores that carry a sports equipment section. If you child wears braces, we recommend asking your orthodontist for a specialized mouth guard that fits over braces. Field hockey ball: We will have plenty of balls to share each week. To practice at home, we recommend that you purchase one for your player. Shin guards: This item will be entirely your responsibility. Make sure that the shin guards fit properly and are of adequate quality. Sticks 'n Flicks, a specialty field hockey store in Macungie, will have a Brine youth pull on shin guard for around $12.50. This shin guard will be available in a youth and an adult size. The youth size fits players 4’6” or shorter. The adult size fits those over 4’6”. Eye Protection: Eye wear is mandatory for all girls in age groups 3/4, and 5/6. Please visit Sticks 'n Flicks for eye protection for field hockey. Uniform: Each player will receive a t-shirt that will serve as their game jersey. Each team member will have the same color shirt. Be sure to fill out your daughter’s t-shirt size when you register her on the website. This way the shirts will be ready for the first night of practice. You are under no obligation to purchase anything from Sticks 'n Flicks, however it is an outstanding store for all of your field hockey needs. Your child will receive proper attention when it comes to outfitting her properly. Currently the NYAA Field Hockey program in only in-house, meaning we play against the other NYAA teams within the same age division. Our goal is to eventually start a youth league amongst other schools.